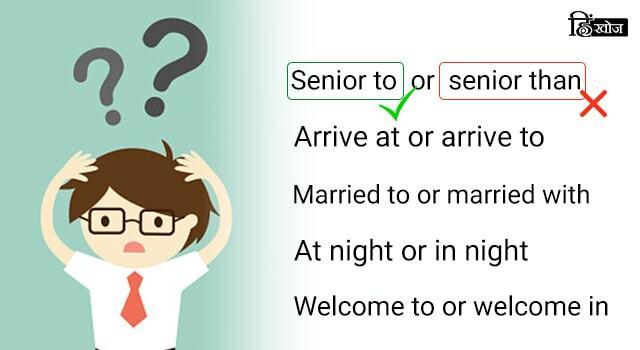 A preposition, as defined by the dictionary, is a word governing, and usually preceding, a noun or pronoun and expressing a relation to another word or element in the clause. • The keys are on the table. • He is sitting in the car. • I’m very fond of rain. • We went for a walk despite the rain. Since prepositions are quite commonly used, they are also quite commonly mistaken. Incorrect We arrived to the airport this morning. Correct We arrived at the airport this morning. Incorrect I like to roam around in night. Correct I like to roam around at night. किसी मेहमान का स्वागत करने के लिए ‘welcome’ का use किया जाता है परंतु ‘welcome in’ कहना गलत है।You always say ‘welcome to’. Incorrect Welcome in our country. Incorrect Sam is married with my cousin sister. Correct Sam is married to my cousin sister. Incorrect Amy is senior than me. Correct Amy is senior to me. • Dina’s birthday is in July. • My Dad always reads newspapers in the morning. • My brother lives in London. • On Friday, the President arrived in India. • This dress is also available in blue and pink color. • I don’t believe in reincarnation. • I’ll come to your home at 1 in the afternoon. • They all were laughing at me. • I’ll meet you at the bus stop. • Your book is on the table. • The magazine comes on every Sunday. • The building is on fire. • Mom is talking on the phone right now. 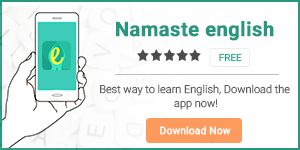 To further improve your English language skills, download our apps Namaste English and HinKhoj. REGRETS and WISHES: How to express them? Anyway Vs. Any Way: Differences and Usage?